So says René, one of our regulars. Whether you’re looking for an early breakfast with your business colleagues to fuel up on the good stuff before that big meeting, or just dropping in to meet a few friends over coffee and some home baking, Victoria St Cafe is the place to warm your cockles. We’re on the corner of Victoria and Bond streets in Wellington’s CBD, a stone’s throw from Civic Square. Read May 2016 Victoria St Cafe review from David Burton, of the Dominion Post, on Stuff. 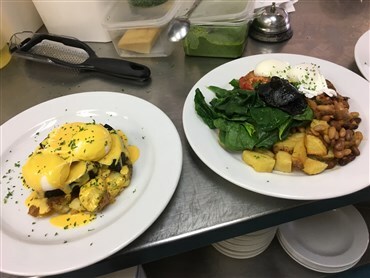 Join us for breakfast and lunch and savour our hearty, simple, healthy food, including gluten-free and vegan options. We’re often complimented on our excellent coffee and teas, our smoothies and salads are legendary, and our home-baked cakes and slices are delicious. We’re licensed, too, so you can choose a cold beer or a glass of your favourite wine to accompany your meal.